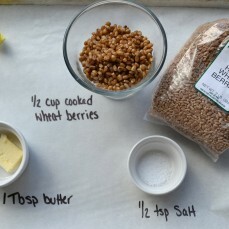 Combine the butter, brown sugar and white sugar in a separate larger bowl. Mix together with a wooden spoon until well combined. 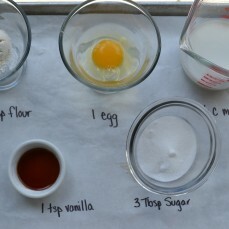 Add an egg one at a time to the butter/sugar bown and mix with the wooden spoon until combined and creamy. 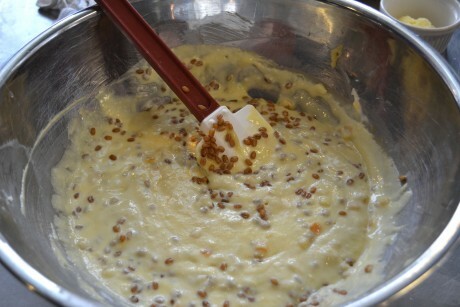 Gradually add the ingredients of the first bowl to the second bowl while mixing. Add the semi-sweet morsels and mix. 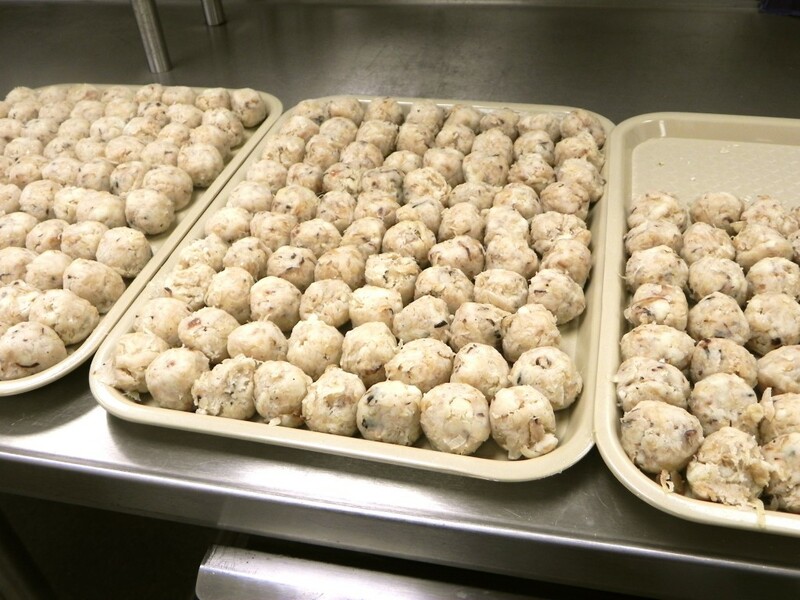 Spoon onto tray with into small balls and bake for 11-12 minutes. Because I was beginning my own family, it became fun to adopt many of these traditional foods and start our own family traditions. It all began right before Easter when Joseph, a 7th grader, brought me a beautiful big cookie wrapped in cellophane with a seasonal bow. He said it was something his family made every Easter and he wanted to share it with me. 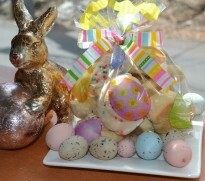 It was a buttery cookie wrapped around painted hard-boiled eggs. Of course, I sampled some of the treasure with a hot cup of coffee. As I was a newlywed I unselfishly took the rest home for my husband. He proceeded to devour the remaining cookie and asked me, “What was that crunchy stuff around the egg?” Needless to say, he was surprised to find out that he ate the egg shell. I think it is important to mention that my husband is of Italian/Russian decent. 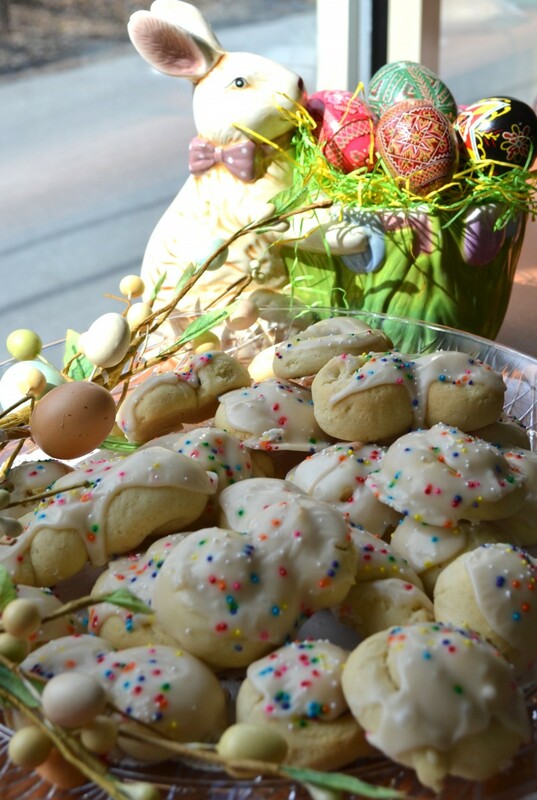 His father who was of Italian heritage passed away when my husband was young, so he was raised with the Russian holiday traditions and therefore NO Italian Easter cookies for him! Fast forward 33 years later—I now have three sons and one beautiful daughter-in law. I’m happy to say our family celebrates many traditions, and of course, all of them include food. Just to name a few: the seven fish dinner on Christmas Eve, Saint Patrick’s day with scones and Irish soda bread, Faschnaut day with homemade doughnuts. 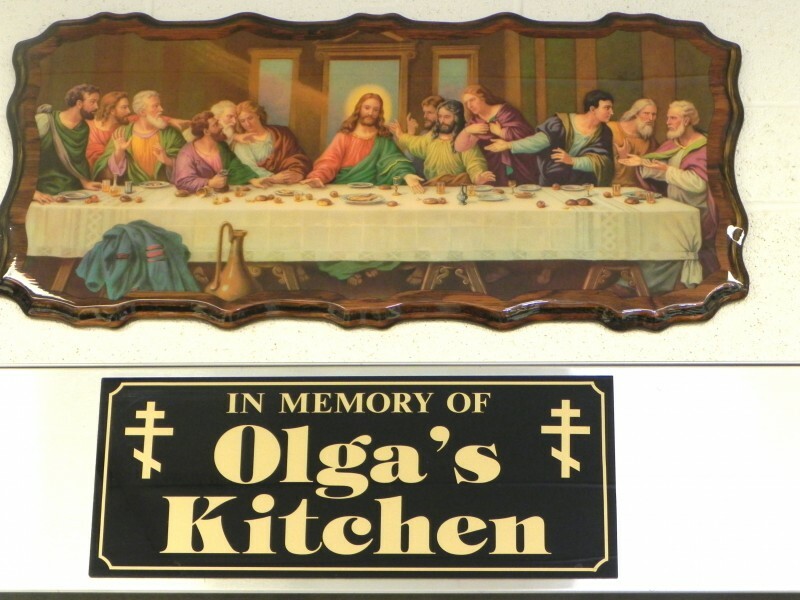 And on Easter we celebrate the Russian traditions with Uncle George’s paska (Easter Bread) and Saint Nicolas Church’s homemade pierogies. 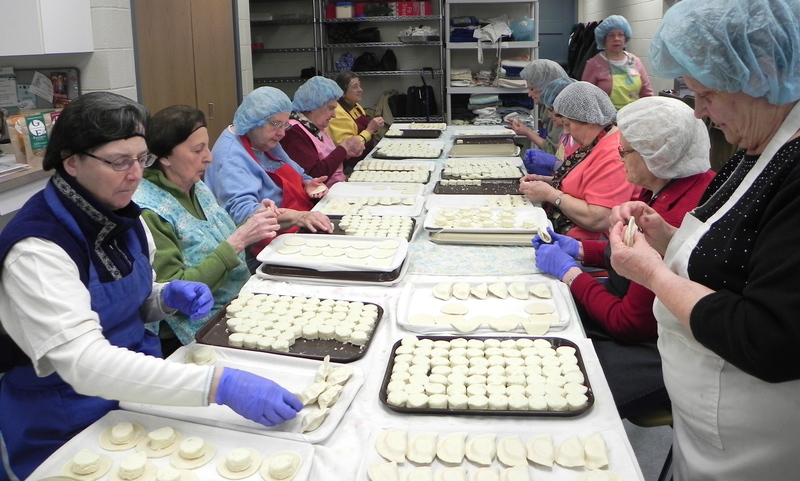 The pierogies are delicious and made by hand by the church parishioners (see photos below). You name a holiday and we’ll cook some food to celebrate it! “Family traditions counter alienation and confusion. They help us define who we are; they provide something steady, reliable and safe in a confusing world. I hope throughout the years of teaching I’ve inspired my students to start their own family traditions. I always told them “you have no control over the family you were born into but you DO have control over the family that you one day create.” So, start you own family traditions, celebrate your culture and cook up some great memories! 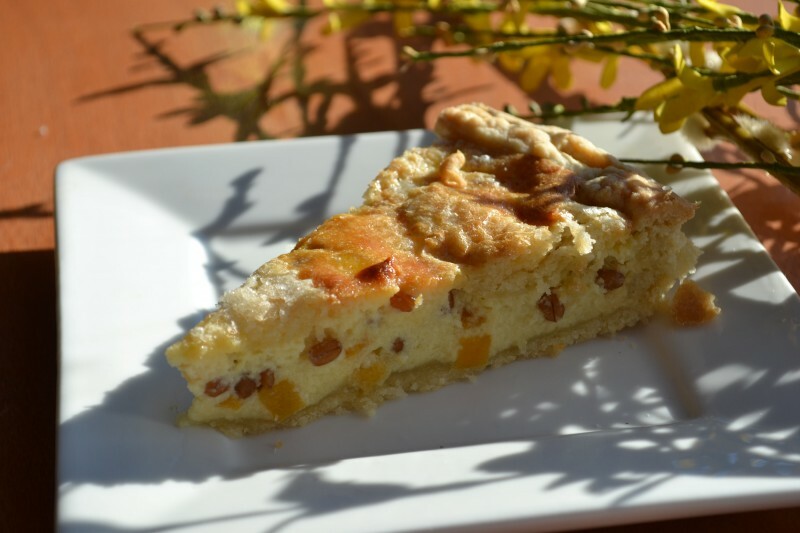 Pastiera Napoletana is a sweet wheat berry and ricotta pie that originates in Naples, Italy. 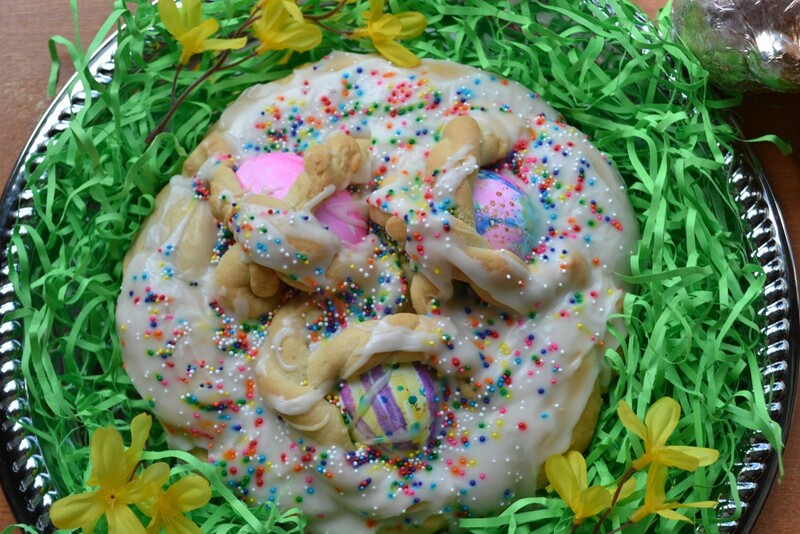 It is a traditional dessert served on the Easter Holiday in many Italian families. While this recipe is a bit “labor intensive” because of the 4 components, it can be made well in advance and frozen until the day before serving. If you make one, you may as well make a few, as your guests would be very grateful to enjoy the next day! Allow yourself 2 days for making this cake, one for the prep and the other to assemble and bake. 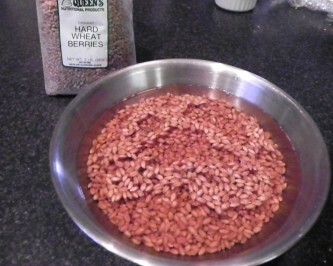 Wheat berries may be purchased at a health food store, orange flower water at a middle eastern grocery. 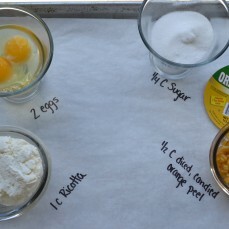 For the Pasta Frolla, combine the dry ingredients in a mixing bowl. Rub in the butter with fingertips making sure the mixture remains cool and powdery. 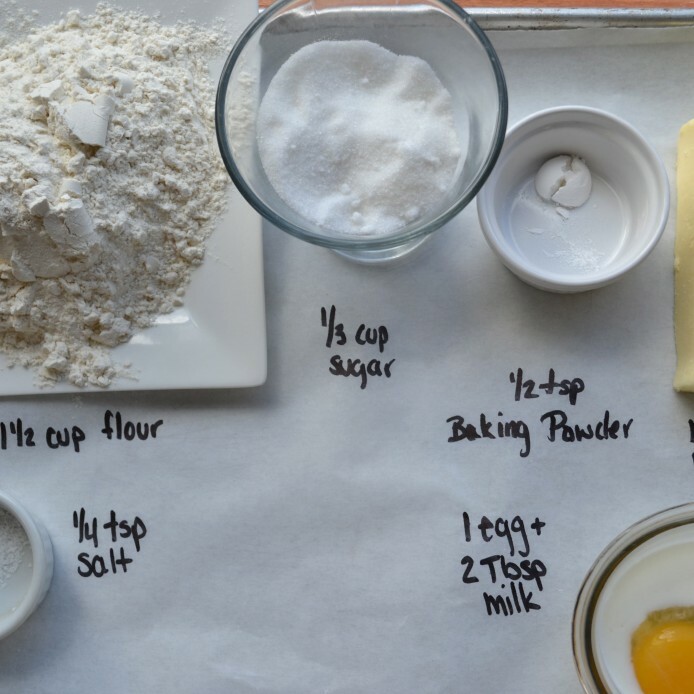 Beat the egg and milk together with a fork and stir into the dough. Continue stirring until the dough begins to pull together. 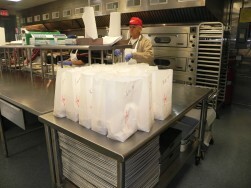 Knead dough lightly on a floured surface, shape into a disk and wrap in plastic wrap. Chill dough. Soak the wheat in water and cover overnight if possible. 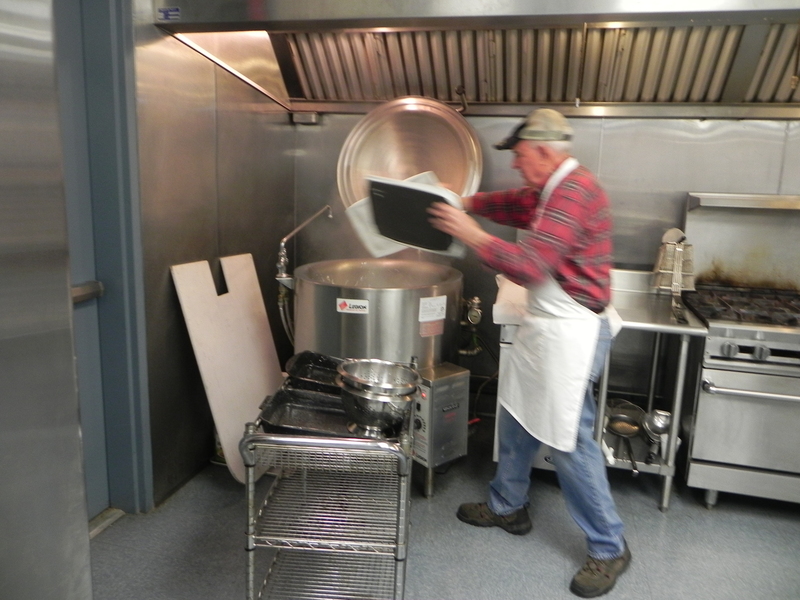 Drain the wheat and place in a pan with salt and water to cover by 3 to 4 inches and simmer until tender, about 2 hours. Add water as necessary to keep from drying out and sticking. Cool and refrigerate until needed. For the pastry cream, combine sugar and flower in a small sauce pan. Stir well and slowly add milk, whisking until smooth. Whisk in the egg. Cook over low heat, stirring constantly until the pastry cream thickens and comes to a boil. Boil, stirring constantly, about 30 seconds. Remove from heat and stir in vanilla. Press plastic wrap against the surface and chill. 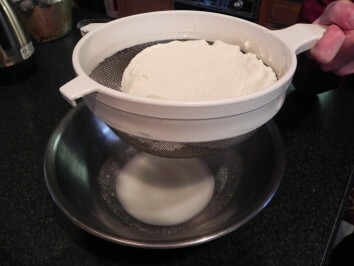 To assemble the filling, beat ricotta to soften it, beating in the sugar. Beat in eggs and remaining ingredients. 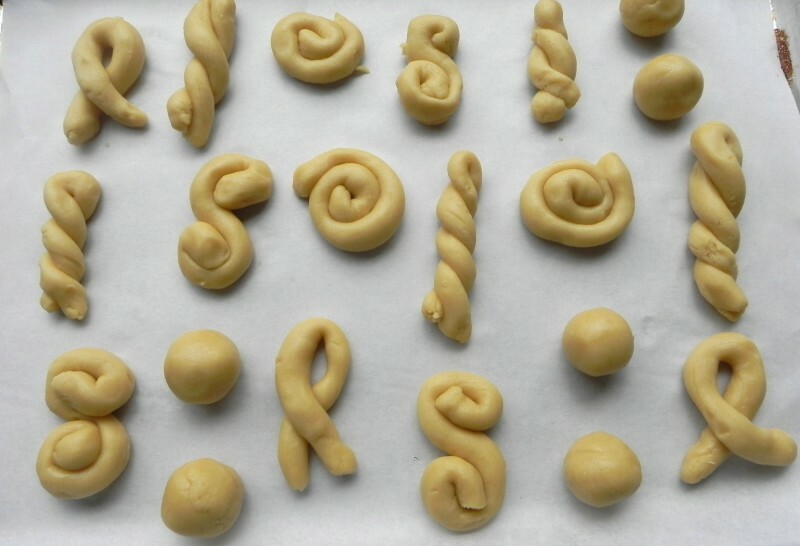 Stir in the cooked wheat and the pastry cream. Butter a 9-inch cake pan, 2 inches deep. 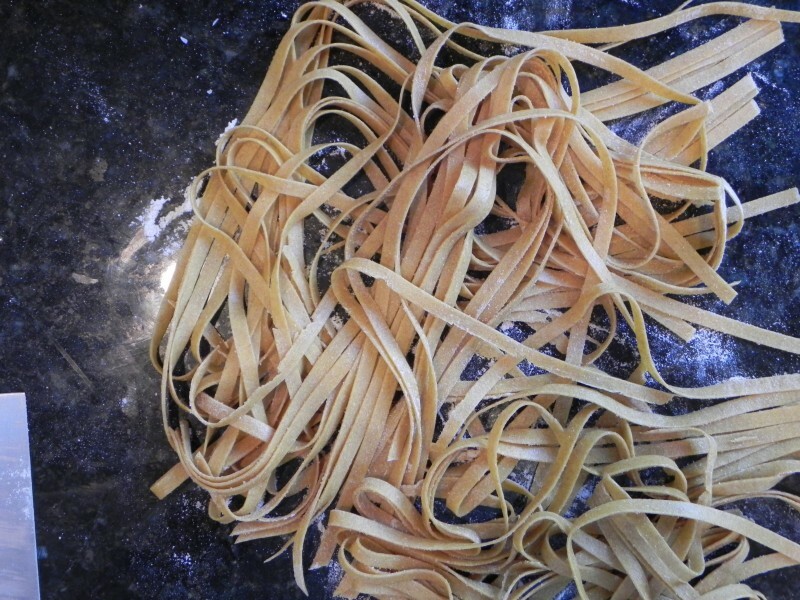 To assemble, cut off 1/3 of the Pasta Frolla and reserve it. 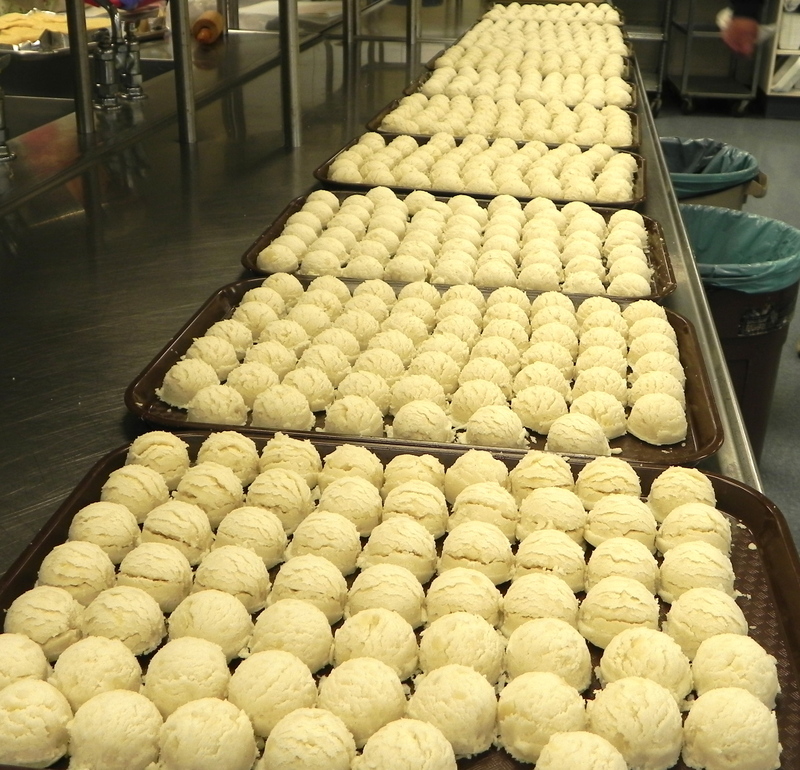 Roll the 2/3 of the dough into a 14-inch disk and line the prepared pan with it. Allow the dough to hang over the edge of the pan. Pour in the Filling and sprinkle with cinnamon. 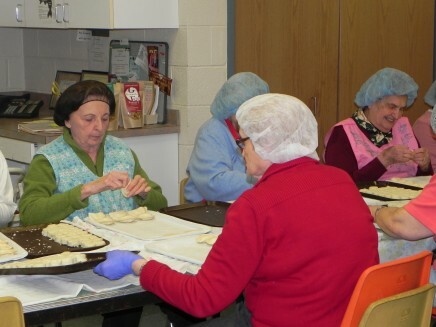 Roll the remaining 1/3 of dough into a 10-inch square. Cut it into 10 1-inch wide strips. 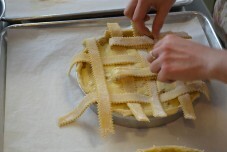 Paint the strips rim of dough in pan with egg wash, and adhere 5 strips in each direction, forming a diagonal lattice. 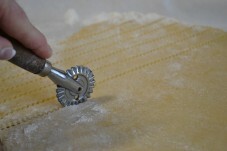 Trim away any excess dough and push down dough so it does not hang over pan. 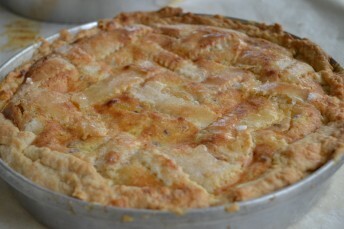 Bake at 350 degrees for about 45 minutes, until the filling is set and pastry is light golden. Cool in the pan before unmolding. 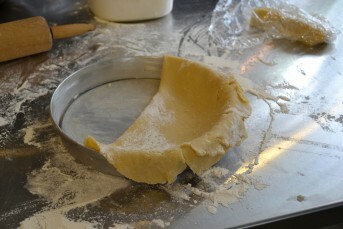 Unmold by inverting the pan onto a flat plate, lift off pan and reinvert pastry so it is right side up. The first meal I ever cooked for a female was on Valentine’s Day. I must have made a good impression because five years later that female, thankfully, became my wife. In February of 2008, I had just started dating Lisa. I wanted Valentine’s Day dinner to be great. I didn’t have a car when I was in college at Richmond, so two weeks before the big day I took the bus downtown and walked the streets looking for the best restaurant to take her to dinner. I must have walked five miles that day looking for restaurants. I saw a few good places, but all were booked for Valentine’s Day. On to plan B: cook dinner for Lisa. My sophomore year, I lived in a dorm on with nothing but a refrigerator. The atmosphere was not exactly a romantic setting. Fortunately, my friends allowed me to use their apartment for my special meal. Let the planning commence! I wanted to WOW Lisa with this dinner, but I knew my friends who had the apartment didn’t cook and wouldn’t have much kitchen equipment. I was going to have to keep the meal simple, but elegant. When it comes to simple and delicious food, there is nothing better than steak, especially Filet Mignon. It’s a beautiful cut of meat that I think is best cooked by searing on the stove top and finishing in a high-heated oven. I knew of a great butcher shop in Richmond, Belmont Butchery, that would cut steak to my liking and had incredible grass-fed beef. 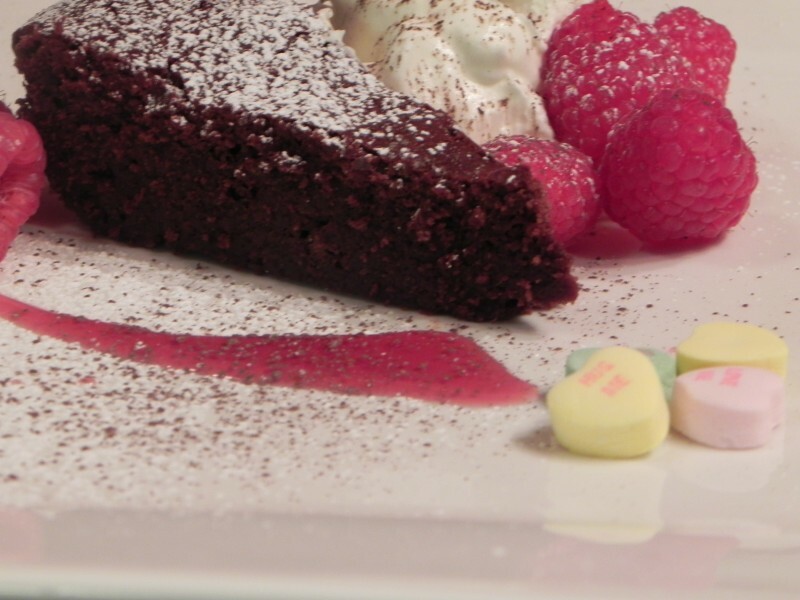 The perfect Valentine’s Day dinner was coming together! I called my mother, Suzanne, to get her thoughts on making the meal special. She had the great idea of shipping me her silverware, candles, placemats and pewter plates to use for the dinner. Everything was set for the big night. When Lisa arrived, I began searing the steaks. After searing, I put the pan into the oven at 450 degrees. Now remember, this was the first meal I had ever cooked for a girl. It was also one of the first meals I had ever cooked for anyone! A mistake was bound to happen, and sure enough it did. When I went to grab the pan from the oven, I forgot to wear an oven mitt. After two seconds of holding the pan handle, the burning sensation set in. Lisa was sitting at the table in the other room when she heard me scream and let go of the pan. Luckily, I was able to play it cool through the rest of the evening. Sure, the burn hurt like hell and left a nice blister on the palm of my hand for the next week. But the steak turned out great and Lisa loved the evening. I’d say that was a mission accomplished! We’ve been together ever since that night, and while we’ve celebrated many Valentine’s Day dinners at restaurants, that first evening and home-cooked meal stands out above the rest. So if you’ve waited too long to make a reservation for Valentine’s Day, I recommend cooking Filet Mignon along with an easy appetizer and a few simple sides. Cooking at home will also allow you to splurge on a nice bottle of wine, something like a Napa Cabernet or rich Bordeaux. The meal will be delicious and more memorable than any table for two at a restaurant. Just remember to wear an oven mitt when pulling the pan from the oven. It’s the dead of winter and going outside to light the grill isn’t exactly on my to-do list. But even though it’s February and 20 degrees outside, I’d still love to enjoy a good steak. My favorite steak to cook indoors is Filet Mignon. It’s delicate flavor and tender meat bodes well when seared in a cast-iron pan and finished in a high-heated oven. Filet Mignon is delicious, but not nearly as rich and marbled as a rib-eye or porterhouse cut of meat. So making a pan sauce will add a richer flavor to the steak. Steak au Poivre, translated as “steak with pepper,” is a classic French dish. The steak is coated with cracked pepper, seared in a pan and then finished off in the oven. While the steak cooks, deglaze the pan with cognac or brandy, scraping the good bits off the pan. Either light the brandy with a flame or wait until the liquor burns off. Sauté minced shallots and add heavy cream and reduce until slightly thickened. Finish the sauce with a dash more of cognac and a few whole peppercorns. Voila! 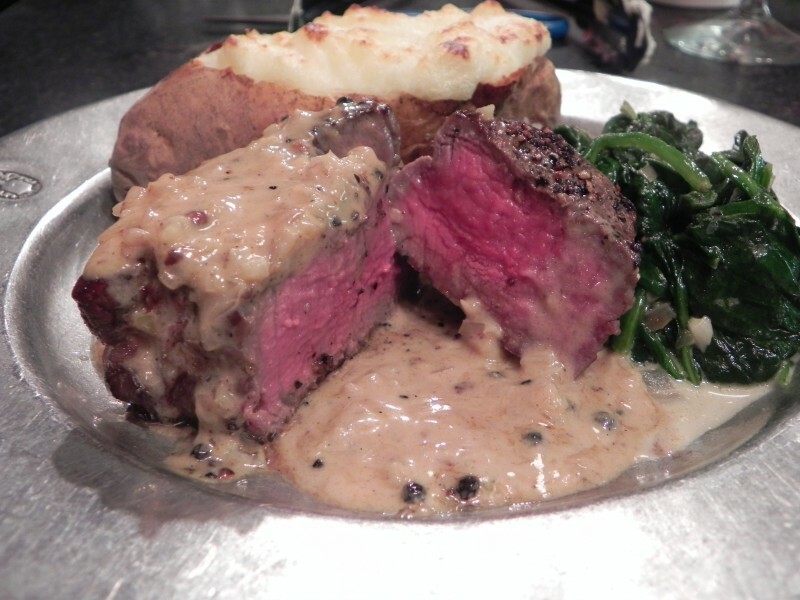 You should pair a great steak like this with delicious Bordeaux wine of Napa Cabernet. High Qaulity Meat: Choose meat that is either USDA top-tier choice or prime grade. There are other certifications and brands to choose, such as Angus beef. My personal favorite has been Braveheart Black Angus steak. It is sold at “The Meathouse” in Summit, NJ. Salt the meat, then salt some more: People rarely salt their meat well enough. When I took a cooking class in New York focused on beef, I couldn’t believe how much salt the chef coated on the steak. But once it was done cooking, I could taste the difference in flavor. I’m not saying you should leave a layer of white around your steak, but grab some kosher salt and make it rain! Sear It Well! Give a nice crust to your steak. 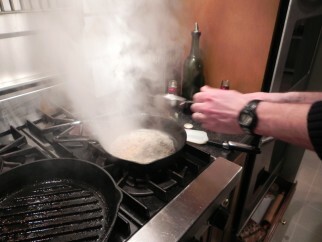 When cooking on a stove top, I recommend using a cast-iron skillet and using a cooking fat with a very high smoke point. I prefer searing steak in Duck Fat. 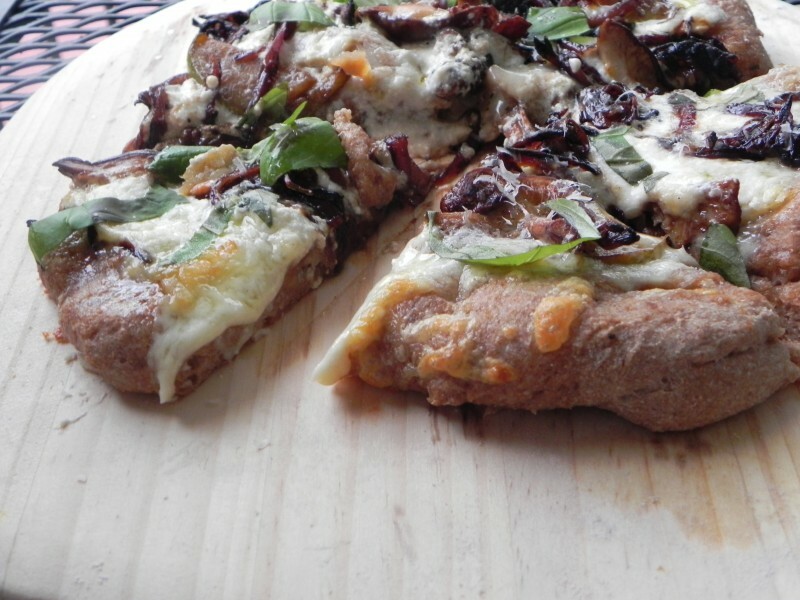 It is flavorful, has a high smoke point, and surprisingly, it is lower in saturated fats than butter. Cook It Perfectly: Medium-rare is the preferred doneness for Filet Mignon. It shouldn’t still be mooing, but it should have a warm red center. You can use a thermometer and it should read 120 degrees for medium-rare. But the more you cook steak, the more you’ll learn if its cooked by pushing down on the top of your steak with your index finger. Medium rare meat should have the same spring as the skin that is just below your thumb. Let it Rest: Once your steak is cooked, place it on a cutting board and cover it with tin foil for 5 minutes. This lets the juices of the meat settle and the flavors to meld. If you cut the steak as soon as you finish cooking it, all of the juices will pour out of the meat onto your plate. Remove the steaks from the fridge and salt the meat on both sides. 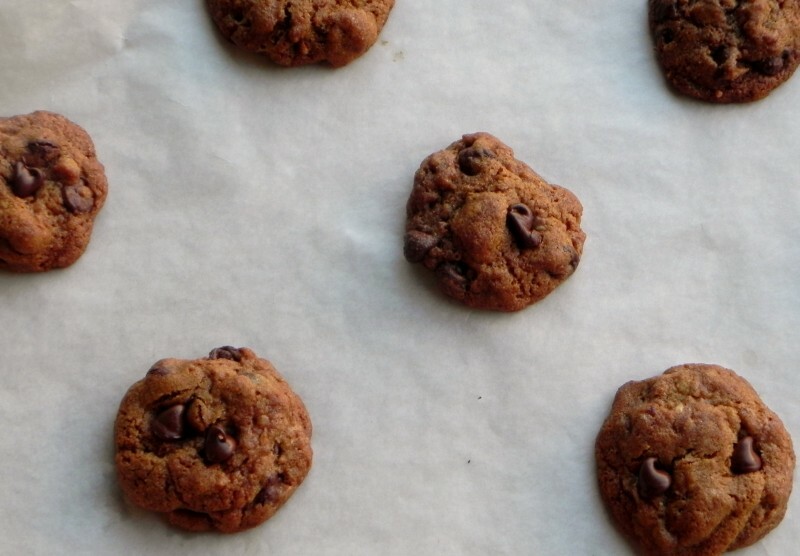 Let rest at room temperature for at least 30 minutes. Coarsely crush the peppercorns with a mortar and pestle or the bottom of a cast-iron skillet. 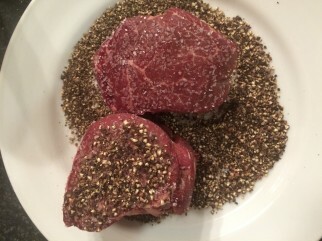 Spread the peppercorns evenly on a play and press each side of the steaks into the peppercorns so that the surfaces are coated. Heat a cast-iron skillet and melt the duck fat or olive oil in the skillet is very hot and just smoking.. Place the steaks in the skillet and sear for 3 minutes on one side. Then, flip the steaks and sear the other side for two more minutes. Take the steaks out of the oven, place each on a cutting board and cover with foil to keep warm. In the skillet you used to sear the steaks, add the brandy or cognac and carefully ignite it with a lighter to burn off the alcohol. Once the flames die down, turn the heat to medium and add the minced shallot. Sauté until fragrant. Add the cream and bring to a boil. Whisk until the sauce coats the back of the spoon, about five minutes. Turn off the heat and add a dash more of the brandy. Season with salt to your liking . 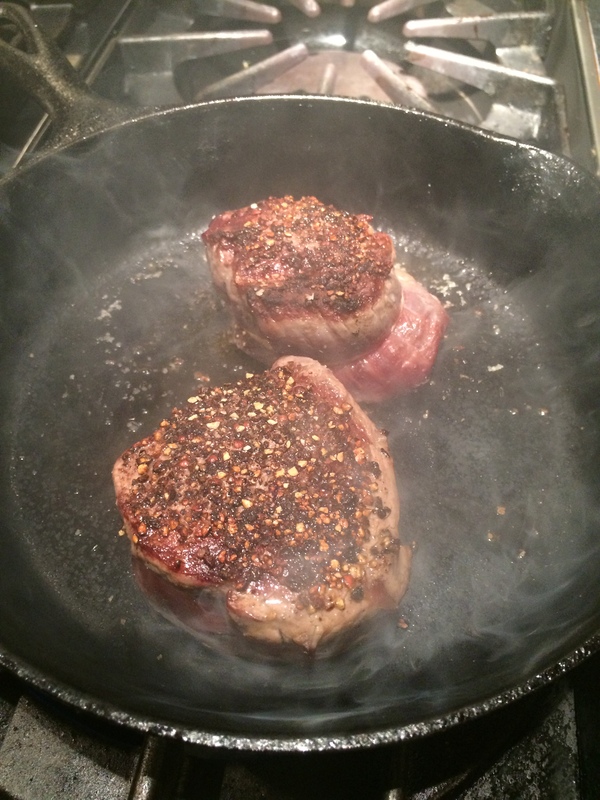 To serve, spoon sauce over the top each steak and garnish with crushed peppercorns. Wash the potatoes and fork each potato several times. Bake in the oven at 375 degrees for one hour or until soft on the inside. Remove the potatoes from the oven and allow to cool slightly. 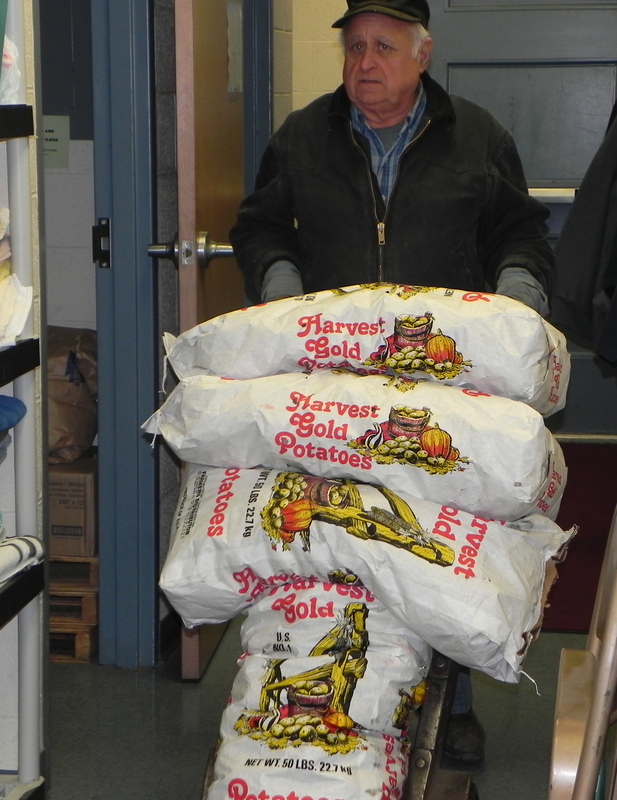 Cut the top third of each potato off with a knife and scoop the insides of the potato into a large mixing bowl. Be sure to not cut through the skin since you'll be using it to stuff the potatoes. Add the heavy cream and sour cream and butter to mixing bowl and mash a potato masher until smooth and creamy. Season with salt and pepper to taste. Scoop the potato mixture back into the larger skin portion of each potato. Each potato should be look over-stuffed. Place the stuffed-potatoes on a parchment-lined tray and put back in the oven for 10-15 minutes. Serve warm with the steak. Heat a medium-sized sauté pan and add the olive oil. Add the shallot and sauté for two minutes until soft and fragrant. Add the garlic to the pan and sauté for another minute. Add the cream and all it to thicken for 4-5 minutes so that it coats the back of a spoon. Add the spinach, turn the heat to low, and cover with a lid for 3-4 minutes. It will initially look as though the pan is overflowing with spinach, but once the lid is placed on top the spinach will wilt drastically. Take off the lid, season with salt, pepper, and add the grated nutmeg and parmesan. 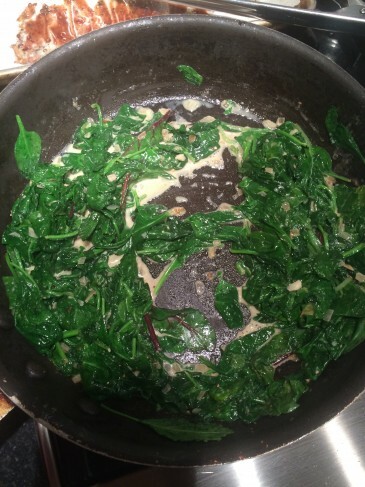 Stir the spinach to mix the flavors and prepare for serving. Heat broiler. Brush both sides of baguette slices with oil; place on a rimmed baking sheet. Broil until golden, 1 to 2 minutes per side, rub raw garlic clove on each slice, set toasts aside. In a small sauce pan, place 1 tablespoon olive oil and sauté until translucent. Add figs, sugar, wine, thyme, and a pinch of salt. Bring to a boil and reduce to a simmer. Cook until thickened, 7 to 9 minutes. Let cool to room temperature. 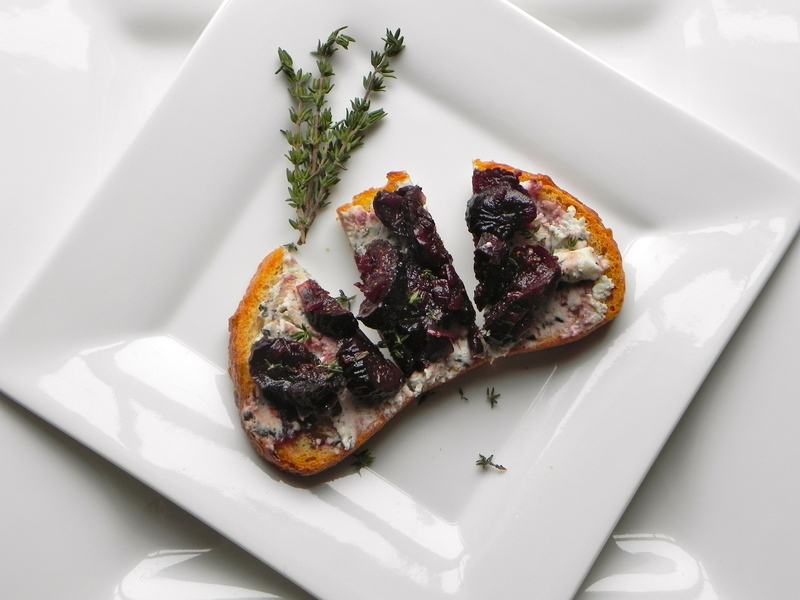 Spread each toast with goat cheese and top with compote. Garnish with fresh thyme.